This short thirty- two page book perfectly illustrates the reason for the season! 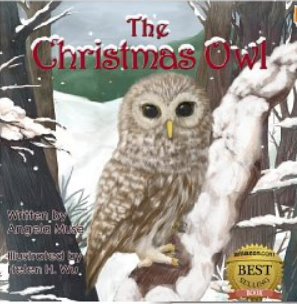 The story presents an owl protagonist who has fallen out of its nest and is now unable to fly. This poor creature hops from place to place seeking refuge from the cold and snow. He meets four animals on his journey, a rabbit, a bat, a mouse and a duck. Each of them is reluctant to share its shelter and questions the owl as to what food will he eat. But the owl does not mean to intrude and makes due with whatever that animal has readily available in their shelter. The next morning the owl departs without notice. On Christmas Eve, he is able to fly again and soars to his nest. However, the first thing he does is fly back to each of his benefactors and drop a gift with a thank you note to each of the Good Samaritans! This story is written in rhyme which is very well written and in smoothly flowing verse. Accompanying the text are gorgeous illustrations done in soft, warm colors which project the warm and cozy feeling of the plot. The faces of the animals appear almost human; personification plays a large role in the story line. For example, the bat is an avid reader of books; the mouse has a very cozy house complete with rugs, furniture and a warm, glowing lantern. Even very young children will understand the message of kindness and the gratification that comes from helping someone in need. The owl’s generosity and extension of friendship and thanks sets up a powerful model lesson for children and adults to follow. I highly recommend this book for children aged three to adults and as an excellent addition to a home library, classroom reading shelf, or the public library. 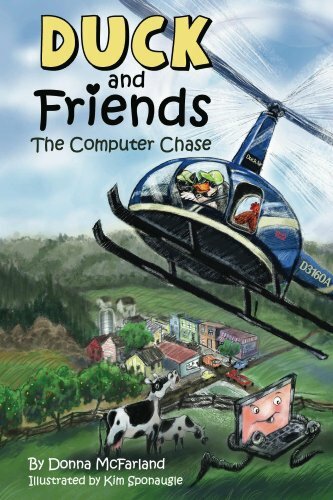 The author and illustrator have done a wonderful job of merging images and story line. This book is sure to become a favorite Christmas story to be reread every year. Personally, I can’t wait to read this one to my grandchildren! A Barred owl becomes injured and must ask others for help. He promises to give back to those who have a generous heart and he is true to his word. Also check out Lil Glimmer, The Nutt Family: An Acorny Adventure, The Pig Princess, The Bee Bully, Eager Eaglets: Birds of Play, Cactus Charlie, Suzy Snowflake and Monsters Have Mommies by this author. I was born in California to a military family. This meant that I was the “new kid” in school every couple of years. It was hard always trying to make new friends, but I discovered I had a knack for writing. I began writing poetry in high school and really enjoyed expressing myself by using pen and paper. After becoming a Mom in 2003, I continued my storytelling to my own children. In 2009 I wrote and published my first children’s book aimed at toddlers. In 2012 I am set to release several more children’s books. Check out what I’m working on by visiting my children’s book blog. Writing is such a wonderful creative process and I look forward to sharing more of my stories with lots of new little readers!